A platform as massive as Facebook is bound to have some confusion around its features and functionality. And with so many moving parts, marketers may find it challenging to decipher which features are best for their business. One of the biggest sources of confusion for a business is whether to use a Facebook Profile or a Facebook Fan Page to represent yourself. Choosing incorrectly could prevent you from accessing unique tools and running Ads and limit your visibility into user data. Arm yourself with all the necessary information before making a decision to ensure you’ve set yourself up for success on Facebook. There are two ways you can represent yourself on Facebook, but it’s important to understand the differences between the two in order to effectively manage your presence on the social network. A Facebook Profile is a personal account. It’s for non-commercial use and represents individual people. When you first sign up for Facebook, you’re given a profile. Your profile is where you add friends and family and share personal photos, videos and life updates. Unless all of your updates are public, only people you add as a friend will be able to see your content. Non-friends can follow your profile for access to your public posts, but they will not be able to see anything shared specifically with friends or custom groups. For this reason, a Facebook Profile isn’t a smart option for businesses wanting to promote products or engage customers. Using a Profile to share for-profit content is actually a violation of Facebook’s Terms of Service and can result in deletion of the account. A Facebook Fan Page is a business account that represents a company or organization. It looks similar to a Facebook Profile, but it offers unique tools for managing and tracking engagement. While you can only have one Facebook Profile tied to your name, you can have an unlimited number of Pages associated with your account. And unlike Profiles, multiple people can manage and contribute to a Page using their own Facebook login information. Pages are great for building a following online because you’re not limited by friend requests. Instead individuals only have to click the Like button to start receiving your updates in their News Feeds. Use your web browser to visit Create a Facebook Page Based on Your Profile. Click Get Started and follow the on-screen instructions. This process can only be done once. After the conversion, you’ll have a personal account and a Page. You’ll be able to manage the Page from your personal account. During the conversion, Facebook will transfer your current profile picture and cover photo to the Page and the name on the profile will become the Page’s name. You’ll also have the option to add friends as people who Like the Page and to transfer photos you’ve shared from your personal account to the new Page. Pro Tip: You only have access to the tools to help you move information from your profile to your Page for 14 days after the conversion. So plan ahead and only start the process when you’re absolutely ready to move forward. Depending on the category you choose, you’ll have access to different features. 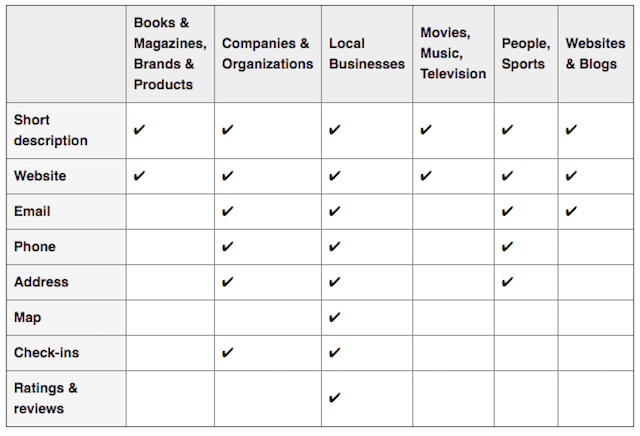 Although the terminology differs slightly, this table outlines the differences across the various categories. Click About under your cover photo. Navigate to the left column and click. Hover over Category and click Edit. Select a category from the drop-down menu. These features will only impact the basic information portion of your Page. Other features available to Facebook Pages include call-to-action buttons, visitor data and the ability to reach more people by boosting your posts. The online retailer Dollar Shave Club used a call-to-action button on its Page. Over a three-week period, the brand saw a conversion rate 2.5 times higher than other social placements. To add a call-to-action to your Page, go to your Page’s cover photo and click Create Call to Action. 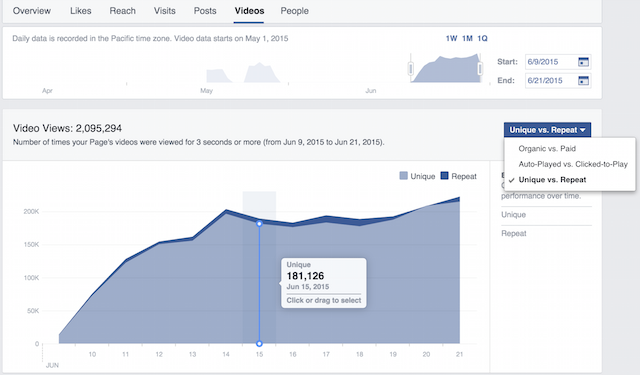 When you create a Facebook Fan Page, you’re also given access to Page Insights. This provides you with information about your Page’s performance, such as audience demographic data and how people respond and react to your content. Insights can play a major role in developing your content strategy. Not only will you have a better understanding of how people interact with your content, but you’ll also begin to see trends about when your audience is online. Use this information to create and publish posts that are more likely to reach people. To access Insights, click Insights at the top of your Page. Access different sections (such as Likes or Reach) by clicking the sections on the left side of the screen. Audience Insights is a separate tool that provides behavioral and demographic data for a segmented audience of your choice. It offers a much deeper dive into your fans’ behavior on and off Facebook. For example, you’ll have access to information like demographics, Facebook usage, purchase activity and Page Likes. 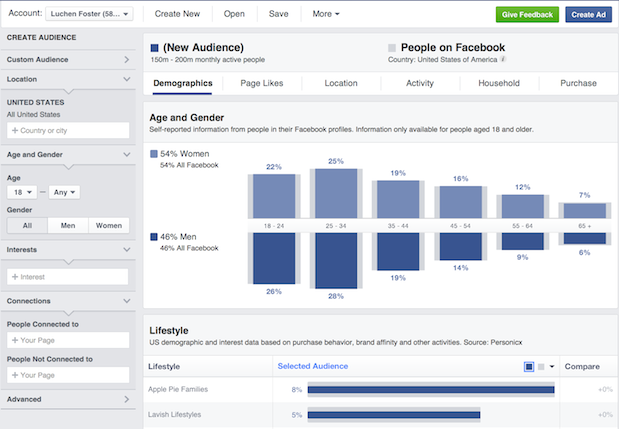 We covered everything you need to know about Facebook Audience Insights in an earlier post. Here you’ll find more information on how to use this tool and why it’s a beneficial asset to your business. To begin exploring, visit facebook.com/ads/audience_insights or select Audience Insights from the Tools drop-down menu in Ads Manager. The content delivered to fans in News Feed is heavily influenced by Facebook’s Edgerank algorithm, but it’s not totally out of your control. By boosting your post you increase the likelihood that your target demographic will see it in their feeds. Boosted posts will appear higher in News Feed and can include most of the posts you create—status updates, photos, videos and offers. The cost of doing this depends on how many people you want to reach. You can see different budget options by going to you posts and clicking Boost Post. Higher reach can be achieved by either increasing your budget or refining or experimenting with your targeting preferences. While Facebook Fan Pages are designed with brands and businesses in mind, celebrities and public figures will certainly benefit as well. Since you’re just one person, it may be tempting to build a community around your personal profile, but then you’d be missing out on all of the features mentioned above. Additionally, Facebook Fan Pages can have an unlimited number of fans. Profiles, on the other hand, can have a maximum of only 5,000 friends, but an unlimited number of followers. If you’re trying to build a large community, Profiles are limiting. As a public figure or celebrity, you run into a lot of copy cats and impostor social profiles. By using a Fan Page, you can verify your account. Once you’re verified, a blue badge will display next to the name of your Page. This shows fans that your Page is legitimate so they’ll have access to the most accurate information. We should note that brands also have the option to have their Pages verified. While most Pages will display a blue badge, local businesses will have a gray badge to differentiate from celebrities, sports teams and other public figures. If you’re a business, follow these steps to verify your Page. As a business or brand, there are many benefits of having a Facebook Fan Page over a Profile. Whichever you choose, the next step is to focus on maintaining engagement. Building a successful presence on Facebook requires work, and great engagement starts with you. Create a resource. Focus on creating a Timeline that’s active and valuable to visitors. The information doesn’t need to be exclusive to Facebook, but ensure that it’s relevant, interesting and helpful to your customer base. Be responsive. Great engagement is a two-way street. Don’t just broadcast your message and ignore incoming conversations. Always respond to messages and comments. Not doing so can really hurt your brand. Support other Pages. It’s not always about you. Make sure to mix up your content and balance promotional posts with something more fun. A great option is to highlight Pages associated with your brand, especially collaborators or partners. Encourage participation. Make your posts interactive. Design content that’s sure to get responses by asking questions or prompting a creative challenge. We understand how difficult it can be to manage multiple Facebook Pages and keep up with all posts and comments. Through Sprout Social’s Facebook management tools, you have the ability to put all your Pages into a single, filterable stream. This make’s it easier to monitor and engage with your fans without skipping a beat. 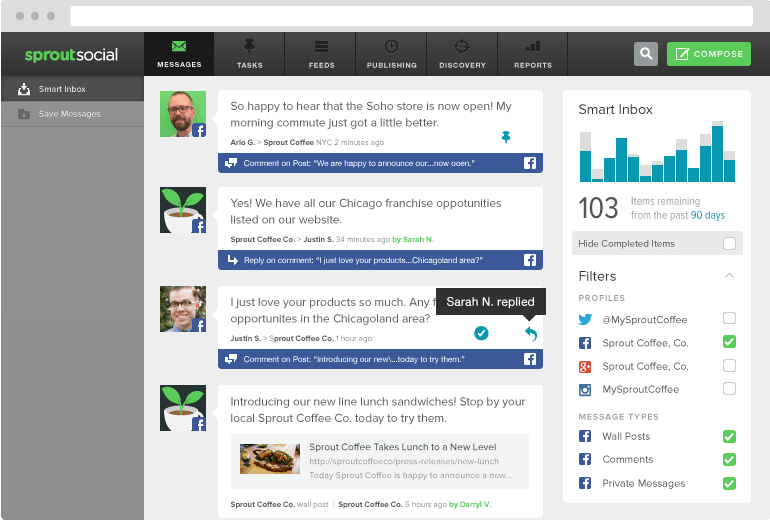 If you’re looking for a solution to manage your Facebook Pages, try Sprout Social for a free 30-day trial!